Whiplash injury occurs when the body reacts to a deceleration or acceleration force by hyperflexion or hyperextension of the neck. 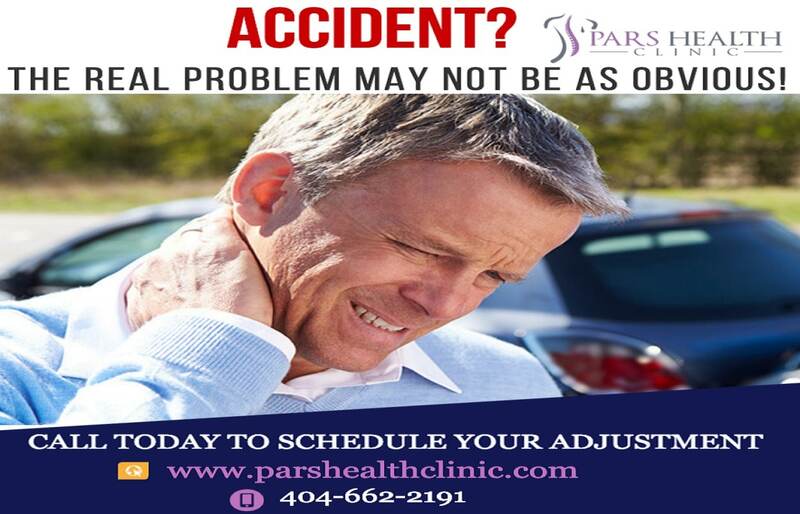 Pars Health Clinic specializes in treating whiplash injuries, auto accident injuries and bicycle accident injuries. Whiplash injuries are very common in car accidents. Whiplash injuries occur, in part, due to the fact that the muscles do not have enough time to brace themselves. A less common, but very debilitating disorder that results from whiplash, is temporomandibular joint dysfunction (TMJ). TMJ usually begins as pain along with clicking and popping noises in the jaw during movement. Our chiropractor at Pars Health Clinic is specially trained to treat TMJ problems. Chiropractic care utilizes manual manipulation of the spine to restore the normal movement and position of the spinal vertebrae. It is by far, the single-most effective treatment for minimizing the long-term impact of whiplash injuries, especially when coupled with massage therapy, trigger point therapy, exercise rehabilitation and other soft tissue rehabilitation modalities by our chiropractor at Pars Health Clinic. So if you were involved in a car accident, contact our chiropractor at Pars Health Clinic Today for an examination. Your health is your first priority.